Dennis was born and raised in Astoria, Oregon. After graduating from Astoria High School in 1970 he attended Willamette University in Salem, Oregon where he received his Bachelor of Arts Degree in 1974 and his law degree (J.D.) in 1977. While a student at Willamette, Dennis interned in the 1973 legislative session, working for a member of the Oregon House of Representatives. In law school he was a member of the Order of Barristers, Moot Court Board and participated in mock trial competitions. In September, 1977 he began practicing law in Newport and has practiced in Newport ever since. Dennis’ practice focuses primarily on real estate and land use. Not only does he do transactional work, he also litigates cases, primarily in the area of real estate. He has litigated numerous cases involving boundary and easement disputes, trespass, breach of contract, and property damage. He also tries cases involving real property and property tax issues before administrative law judges of a number of State Agencies including the Department of Revenue and the Department of State Lands. Dennis has a very active land use practice. He has handled hundreds of land use cases, appearing before numerous planning commissions, city councils, county commissions and the Oregon Land Use Board of Appeals. Given the complexity of Oregon’s land use laws, even getting a permit for a single dwelling can be a challenge and Dennis has obtained numerous administrative approvals at the staff level. In addition to his real estate and land use practice Dennis also represents special districts (fire, water, port, sanitary and road districts) providing counsel regarding personnel issues, contract review and serving as budget officer for a number of these districts for almost 30 years. Dennis has spoken at numerous survey workshops. He has spoken annually at the Oregon Land Survey Workshop at Oregon State University for almost 30 years. Dennis and his wife Jane, who also serves as the office manager for the firm, were married in 1986 and have 2 sons. 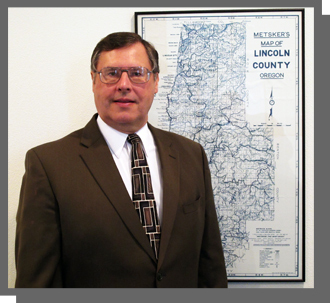 Cliff has practiced law in Toledo and Newport, Oregon since 1977. He grew up in Tillamook, Oregon, where he graduated from high school in 1970 as class valedictorian. He obtained a Bachelor of Science degree at Oregon State University in 1974, and law degree (J.D.) from the University of the Pacific, McGeorge School of Law, in Sacramento, California in 1977. At McGeorge, Cliff was a member of the Traynor Honor Society and received an American Jurisprudence Award. Cliff was admitted to the Oregon State Bar in 1977. He was also admitted to the United States District Court for the District of Oregon in 1978. He served as a Judge Pro Tempore in the Circuit and District Courts from 1996 to 1999, by appointment of the Oregon Supreme Court. Cliff joined the firm in 1999, and represents clients in all types of real estate transactions and litigation, as well as probate, wills, trusts, and estate planning, foreclosures and foreclosure defense, homeowner/condominium association law, and business and commercial law. He has conducted dozens of trials and also serves as an arbitrator in the Circuit Court Mandatory Arbitration Program. Cliff has always been very active in civic organizations, including Economic Development Alliance of Lincoln County (current board member and secretary); Optimist Club of Yaquina Bay (current member, former president); Newport Booster Club (current member); Newport Chamber of Commerce (current member); Olalla Center for Children and Families (former board member and past president); and Oregon State University Thundering Seas Institute (former board member and secretary). Cliff and his wife, Carey, have been married since 1975, and have two daughters and two grandchildren.